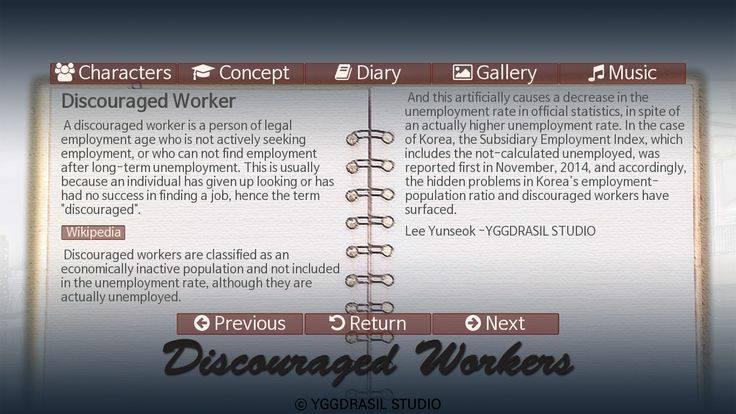 Post news Report RSS	Discouraged Workers V0.9.96 updated for Beta(Early Access)! Thank you for your visit. 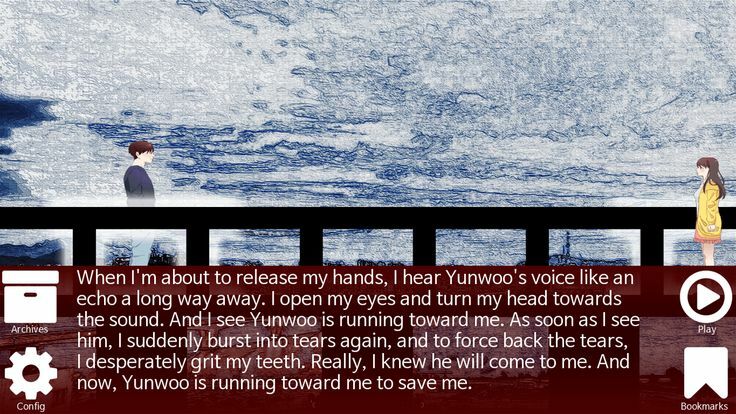 I am Lee Yunseok, creator of YGGDRASIL STUDIO. 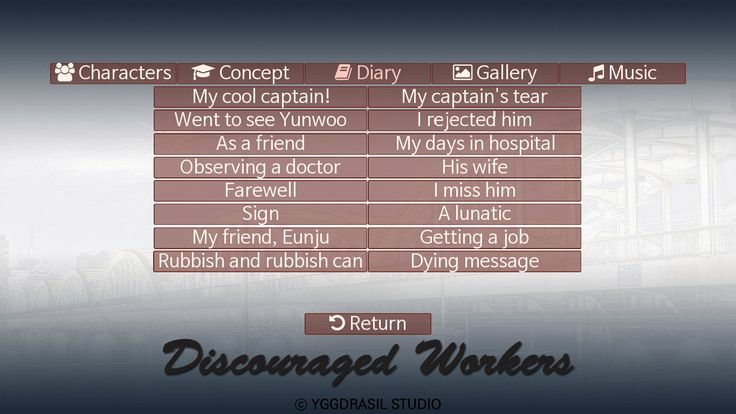 I've updated Discouraged Workers V0.9.96 on September 6th, 03:00~06:20, PDT. Fixed the Concept Archive: 'Epilogue' was replaced by a cutscene. Added Diary Archive. If you have found the Diary, now you can read the Ga-yeon's diary. 'Dying Message' must grant the achievement. Changed Concept Archive items. The column divided. Improved the controller support. When you need to choice('Self-inflicted' and 'Bridge of the Life'), the left stick left will work for the left button, and the left stick right will work for the right button. 'Epilogue' concept item were replaced to cutscene. 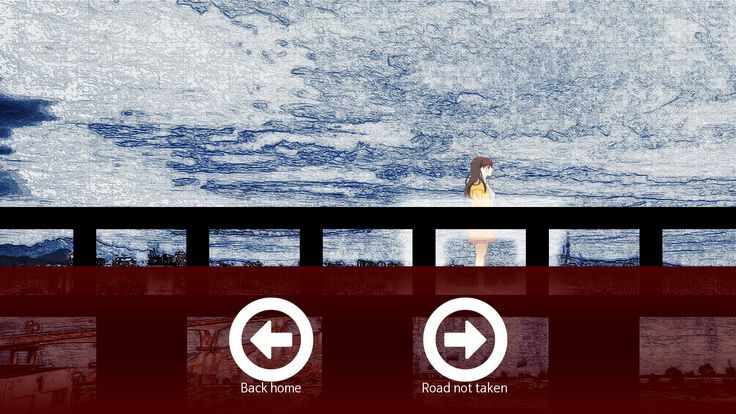 Also, changed the centered texts to dialogues on 'Edge of the world'. Before: Though I was unable to graduate because of financial difficulties, fontunately, I got a job at a hospital without finishing school. After: Though I was unable to graduate because of financial difficulties, fortunately, I got a job at a hospital without finishing school. After: The information is unknown at this time. Before: Bread this early morning? After: Bread so early in the morning? Before: Why haven't you called these days? I heard that you haven't called Mom and Dad for a long time either. After: Why haven't you called me for so long? I heard that you haven't called Mom and Dad for a long time either. Before: After throwing several words, she's waiting for my answer. After: After blurting out those words, she's waiting for my answer. Before: I keep silent for a moment and just wiggle my fingers on the desk. After: I keep silent for a moment and just drum my fingers on the desk. Before: Needless to think, I say, scowling at her. After: Needless to say, I exclaim, scowling at her. Before: I just stop talking. After: I stop talking and look away from Hye-na, just starting off into the distance. Before: Saying like that, she tilts her head slightly to her right hand, where her thumb and fingers are arranged to look like a phone. After: And while saying that, she tilts her head slightly to her right hand, where her thumb and fingers are arranged to look like a phone. Before: Well…, you left so early. I hoped you would have stayed longer and eaten all the bread with me. After: Well…, you left so soon. I hoped you would have stayed longer and eaten all the bread with me. Before: Working at the hospital, I bacame sick of doctors who didn't sincerely care for their patients. So I decided to quit, and today I look forward to change. After: Working at the hospital, I became sick of doctors who didn't sincerely care for their patients. So I decided to quit, and today I look forward to change. Before: He and I are the same age, and we've known each other since we were the high school students. After: He and I are the same age, and we've known each other since we were high school students. Before: I try to see what Yunwoo pointing at. But because he's blocking my view in that direction, I can't see what it is. After: I try to see what Yunwoo is pointing at. But because he's blocking my view in that direction, I can't see what it is. Before: After a while, the dishes are served, and we eat, and continue to talking about the band's poster and pamphlet for the concert. After: After a while, the dishes are served, and we eat, and continue to talk about the band's poster and pamphlet for the concert. Before: Again, I gaze at a baby's picture on the phone, and touch it with my finger. After: Again, I gaze at the baby's picture on the phone, and touch it with my finger. Before: And then again, a step backward. Then, I tidied my rumpled hair, blown about by the wind. After: And then again, a step backward. Then, I tidy my rumpled hair, blown about by the wind. You can check the next update plan from Here.